We explore the dismantling of the traditional legal industry by various new players. ABSTRACT: The legal industry is facing disruption: while historically laggards in embracing technology and alternative business models, Big Law is being forced to accept an industry altering independent of its reluctance – an environment where they may no longer be the top dog. NewLaw firms, legal process outsourcing providers, technology vendors and even corporate legal departments themselves are taking apart the monopoly that Big Law had on the industry piece by piece. The industry finds itself at a crossroads as both Big Law and corporate legal departments grapple with how best to deal with this new ecosystem. Once venerated as an industry of order, structure, and predictability, the historic legal model is being disrupted by new entrants, technologists, and low-cost alternatives. While declarations of the “death of Big Law” suggest existential threat, the ecosystem has instead evolved, resulting in markedly changed competitive dynamics, empowered end-users, and redefined value propositions. See Exhibit 1. This evolution has fundamentally challenged – and forever changed – the traditional, embedded relationship-driven business model characterizing legacy General Counsels and Outside Counsel. Today’s GCs are under pressure by CxO peers to rationalize operations and include defined budgets, cost control mechanisms, and departmental efficiency metrics. While Big Law has attempted to adjust through AFAs and in-house build-outs of variable resources (e.g., Document Review), the ecosystem has evolved ahead of most large firms. The largest driver of change has been the need for improved cost management: much cost control relies on reduced labor cost or increased leverage from technology, for example outsourcing to Legal Process Outsourcing firms (LPO), departmental software such as enterprise legal management (ELM), and technology assisted review (TAR) systems for optimization of the document review process. LPOs are a subset of the broader theme of “business process outsourcing” whereby enterprises have chosen to focus on core strategic matters, variabilizing costs to specialists across specific dimensions, and leveraging “labor arbitrage” in the form of labor rate differentials across regions (e.g., India) for routine work. As GCs continue to engage with outside counsel, LPOs have been selected to carve-out simple, repetitive, and low-judgment tasks that can be delivered with favorable value. LPO providers are broadening their service portfolios but have historically focused on e-discovery, document review, and basic legal research. The model contrasts with Big Law as billing rates differ significantly from the legions of law firm Associates who in aggregate contribute significantly towards matter costs. Notably, the continued rise of LPOs will continue as early resistance due to governance, privilege, and quality have been addressed by both industry-wide initiatives and self-direction through leading service providers. Recently, legal technology has emerged as a credible alternative to professional labor – advances in artificial intelligence, cognitive computing software, cloud processing, and big data analytics have driven the industry to explore the use of platforms like IBM Watson to supplant the use of professionals. While continued advances in the enabling infrastructure are still expected before meaningful scale and penetration manifest as an industry norm, existing technologies such as ELM software and TAR are becoming pervasive, at least for the large enterprise. ELM software packages have pushed GCs to create sophisticated matter management systems, optimize workflows, and track billing and related metrics to ensure operational efficiency is achieved. TAR capabilities have advanced as cloud processing power allow for a “cannibalization” effect vis-à-vis LPOs, reducing the time- and cost-intensity of large-scale LPO engagements. The “technology as leverage” theme has not gone unnoticed: e-discovery software leaders that have aggregated capabilities into a successful license software business model, like kCura, have raised significant capital from investors and have attracted the attention of related startups applying machine learning, AI, and data analytics to legal decision making. The speed and efficiently of these programs will only improve as machine learning is applied to the algorithms that are the backbone of these systems –recent studies point to human-like accuracy of next generation TAR software. 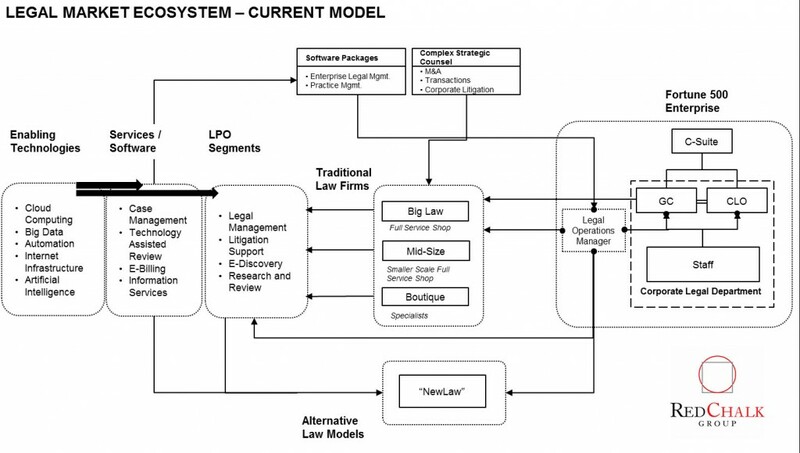 Concurrent with the rise of LPOs and advanced technologies, cost management focus has unlocked a new type of law firm, “New Law”, to emerge and challenge Big Law’s “vertically integrated” workflow dominance. These firms are typically founded by former partners at traditional law firms, indicating a similar level of legal understanding and competence, but operated in a much more efficient manner. The model does not rely upon legions of expensive Partners, Associates, or costly overhead – rather, the service model is innovated through new technology capabilities, best practices from other industries, and the use of efficient, short-term staffing models, to cost effectively carry out a wide array of legal tasks. Notably, the corporate legal department has undergone a major transformation, with one of the most prominent changes being the increased usage of a Legal Operations Manager to focus on operations so GCs and Chief Legal Officers can focus on core strategic and legal matters impacting the company. Before, the GC’s work was burdened with balancing core legal, strategic, and the day-to-day “business” of operating a department. As many GCs lack the formal training and experience needed to efficiently manage a large-scale department, the Legal Operations Manager role has been carved out to ensure that procurement, people management, and processes are managed optimally based on an enterprise’s strategic mandate. These managers typically have business backgrounds and do not have much, if any legal expertise. Moreover, there has been a growing in-sourcing trend, especially routine and predictable work that can be managed with the assistance of technology or LPOs. While outside counsel will continue to be sought after for complex legal matters (e.g., M&A, complex transactions, “bet-the-company” lawsuits), the continued internalization of legal work is a rising threat to traditional law firms. Technology use / adoption – how will technology adoption, both software packages like ELM, and capabilities like TAR, impact the existing workflow? Who will be disintermediated and who is positioned to win? The Future of LPOs – with the advent of advanced technologies, including AI, how will LPOs need to adapt in light of new capabilities and a move away from pure labor arbitrage? Information Services – how will information services providers to the legal sector be impacted by the evolving dynamics of legal? What future business models will be needed to address the market’s needs adequately? Big Law – how will Big Law firms continue to react to the continued disintermediation, automation, and altered client dynamics?